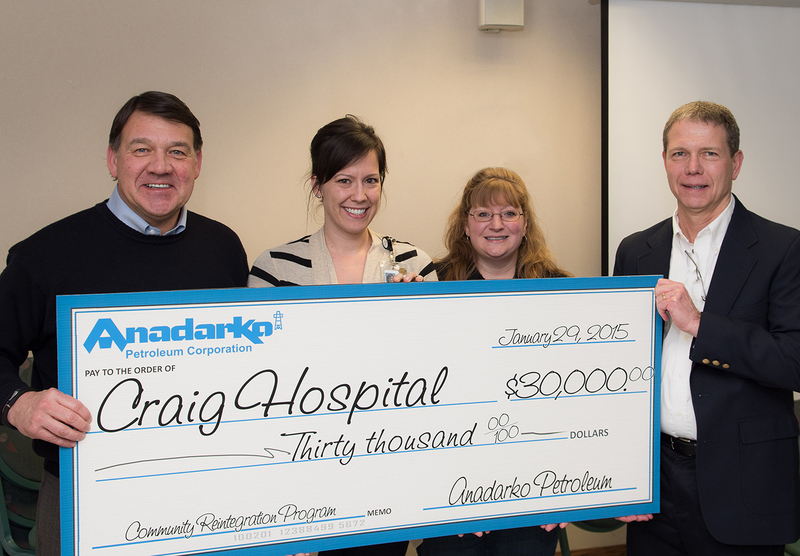 Craig Hospital has received a $30,000 gift from Anadarko. The gift will help fund Craig’s Community Reintegration program, which gives individuals who have been recently injured the skills and opportunity to become economically self-sufficient again. A permanent disability brought on by a catastrophic injury causes profound economic changes for patients and their families. Beyond functional deficits, a spinal cord injury or traumatic brain injury depletes financial resources and places work and career plans on hold, causing further economic setbacks. The Community Reintegration (CR) program works toward returning patients to their former work environment whenever possible. (L-R) Craig Hospital CEO Mike Fordyce, Community Reintegration Specialist Nina Jensen, Community Reintegration Specialist Kelly Lombardi and Mike Nixson, director of Land for Anadarko Petroleum Corporation’s Rocky Mountain and Alaska region. As a patient is nearing discharge, the CR team conducts work readiness assessments and worksite evaluations to look for safety, access and accommodation needs. CR staff offer the employer guidance on reintegrating a former employee back into the work environment and on accommodations that will allow the employee to be successful. Once the patient has returned to work, the CR staff visits the patient at the worksite to ensure things are going well, slowly tapering off as the patient and employer begins to feel more comfortable. When a patient cannot return to a job after injury or were previously unemployed, the CR team helps with career exploration, interest testing and assistance with returning or applying to a university or trade school. The CR staff also connects the patient to resources provided by the Colorado Division of Vocational Rehabilitation (DVR), one of the CR program’s most significant collaborative partners. However, due to a budget crisis, DVR is unable to fund Craig as it has in the past.